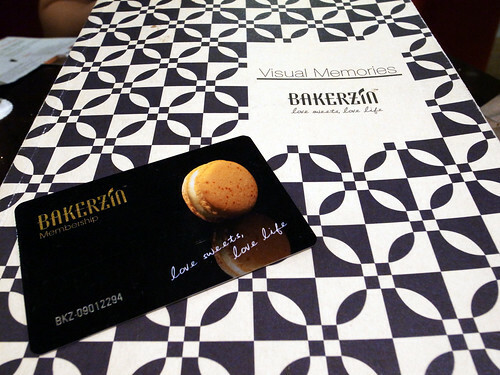 Our new membership at Bakerzin! We wasted no time to enjoy membership perks. 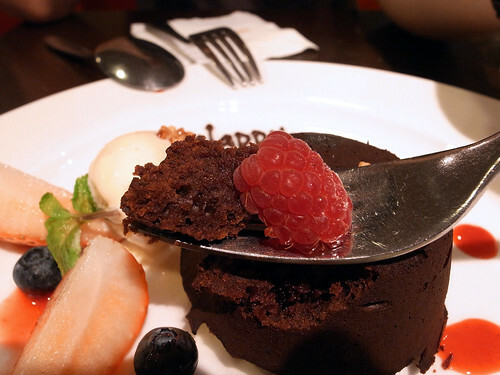 Warm Chocolate Cake that came complimentary with the membership subscription. 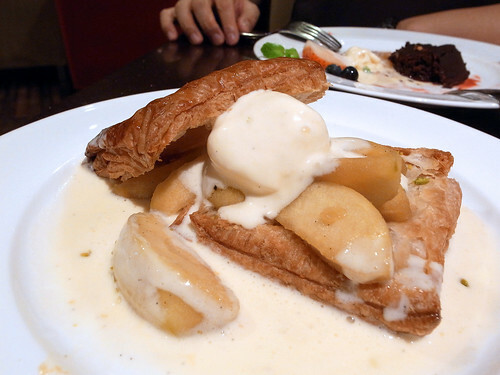 It is petite pastry plated with a scoop of vanilla ice-cream and a selection of fruits. The cake is made from very premium Valrhona Chocolat from Hermitage near Lyon. World renowned French Patissier, Pierre Herme uses the same thing! Mais oui! The cake was moist and soft with sweetness that was nicely complimented by the subtle tinge of tartness from the raspberries. 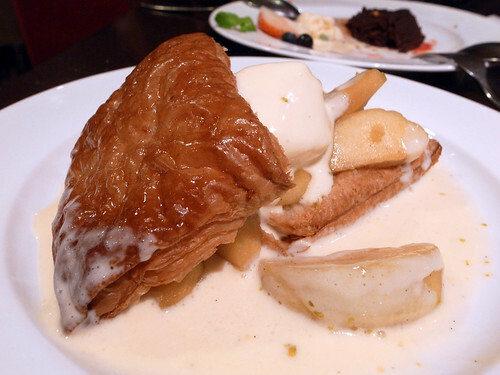 For contrast, we ordered “Mille-feuille with Caramelised Apple”, a vanilla puff pastry, light and crisp, with slices of apple caramelised lightly and not overtly sweet. In fact the apples were a tad too acidic for us. The sauce was a delicious vanilla butter cream that hinted of butterscotch and that helped a lot to balance the sourness of the apples. 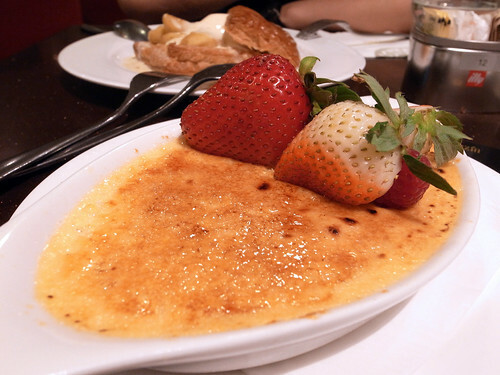 Vanilla Crème brûlée served in a shallow baking dish instead of the usual ramekin. This in retrospect is a brilliant option as the larger floor space available now makes good room for artisan work. Gingerly glaced with a layer of caramelised sugar for good juxtaposition to the smooth custardy base held within. The best is it was served warm, the way we like it. Montage et presentation with an array of berries. This dish, despite being simple, is my favorite of the three. An explosion of senses awaits with the aroma from the caramelised sugar, to the crackling of the top layer revealing the creamy yellow contents. Much like how a young child unwrapping his christmas present with anticipation and eagerness. And we were not disappointed. 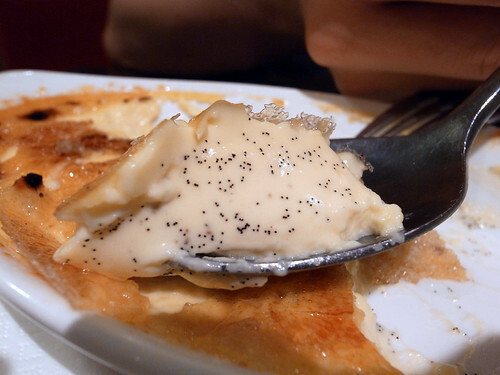 The soft custard was overwhelming with the sweet aroma of vanilla and then we knew why. though subtle, the robust flavours tease out from the real vanilla pods used in this dish really puts those who used artificial vanilla (and that would include me) to shame. And almost orgasmic gastronomic experience I would say.. 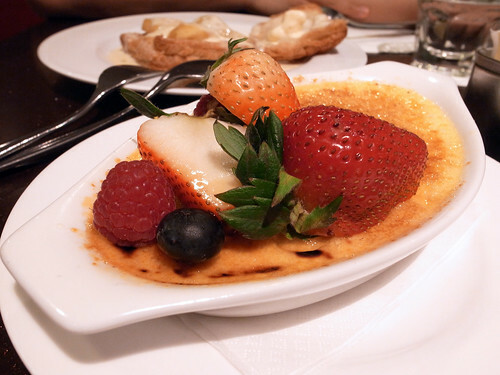 This entry was posted on December 20, 2010 by Alan (travellingfoodies). 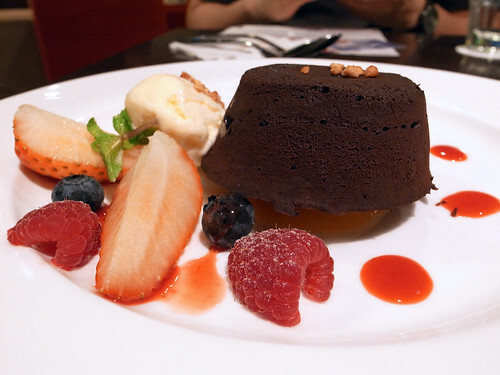 It was filed under Food and was tagged with Singapore, Suntec City Mall.